Nebraska looks like a right shithole. Payne shoots the film with an arthouse zombiefilm sensibilities: beautifully framed and composed shots of boarded up shops, cracked pavements and obsolescent industrial machinery starring a cast of the shuffling elderly who look like they're on their way to audition for Walking Dead. This is the full stop at the end of the American Dream, a grey featureless sea of fields punctuated by ghost ship towns crewed by the damned - people too old, too dumb or too poor to escape. This is road movie as manifesto; a tour of the aftershocks of economic collapse. 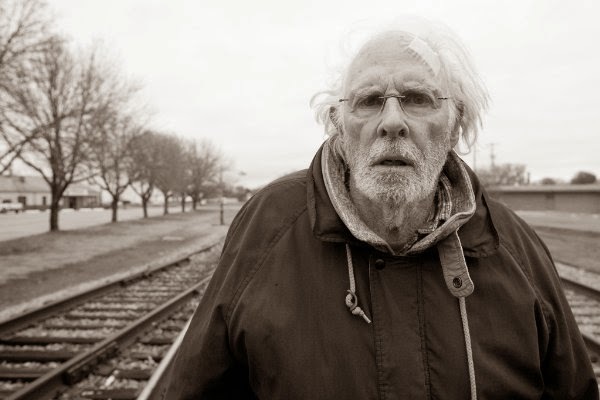 The impetus for the journey is impeccably grumpy old duffer Woody Grant (Bruce Dern). He's so anti-social and single-minded that it's difficult to tell whether he's suffering from senility or just that he couldn't give a crap about anyone other than himself. Woody a casually, brutally, blunt man, restricting himself to single-word responses to questions and displaying a freakishly numb attitude towards most of his immediate worldly needs. The narrative conceit of Nebraska is that he's received a piece of junk mail promising a million dollar prize. Woody wants to travel from his home town in Montana across the country to Nebraska to collect it. He's so singleminded in pursuit of the loot that he's taken to setting out on foot down the freeway hard shoulder, exasperating his wife and adult children. They're beginning to consider putting him in a nursing home if only to give their poor Mum a break. His younger son David instinctively rails against this, arguing that all Dad needs is something to keep his mind in gear. Eventually, at his wits end he decides to drive Woody across the country to the office that issued the junkmail so he can collect his illusory winnings. En route the two stop off in Hawthorne, Nebraska - Woody's home town. It's a podunk dead end in the middle of nowhere: a land that time forgot populated by wrinkled down-at-home boys who've spent a lifetime chopping wheat, milking cows and castrating pigs - and are now left to slowly sink into beery, TV-hypnotised catatonia. Word gets around town about Woody's 'win', and the townspeople, like a drowning man clutching a piece of wreckage, swarm around him - desperate for either a piece of his non-existent pie or simply to bask in his reflected good fortune. That all makes Nebraska sound rather depressing. It's not. Sure there's melancholy, but it's leavened with wry, well-observed dabs of humour. Most of them arise from the irascible temper of Dern's Woody as he monosyllabically grunts his way through scenes that in most other films would be tender moments between father and son. Dern expertly walks the tightrope between making Woody utterly unpleasant and weirdly charismatic - even when drunkenly barking "cocksucker" at his infinitely patient son. The rest of the laughs come from the gawping locals of the town who Payne treats with a sincere Coen Brothers-y fascination. Nebraska is inquisitive rather than judgmental, genuinely wanting to find out how these people make their way through life. 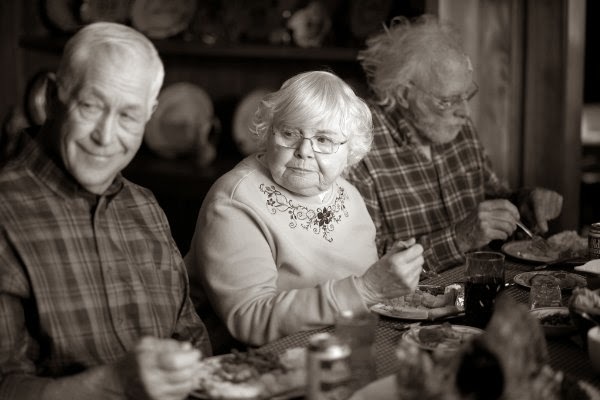 By and large, the elderly population is portrayed as simple, good-natured people happy with their limited lot in life, content to while away the years in a semi-somnolent daze. There's a family reunion mid-way through the film where Woody's myriad brothers gather to stare listlessly at the TV. We watch the scene from the point of view of the television itself, and the slow realisation dawns that we're staring at each other across a geographic and cultural gulf - the Nebraska men silently engrossed in their sport and the London audience quietly enjoying their black and white arthouse flick. Payne is similarly fascinated with decayed American iconography. The camera frequently taking a detour from narrative and character to focus on a passing truck, some piece of farm machinery or an interesting bit of urban decay. There's a telling scene where the characters regard Mt Rushmore from afar, Woody derogatively dismissing it as unfinished - "it's like (the sculptor) got bored halfway through!". This is a mini-mission statement, that Payne is engaged in aggressive deromanticisation of the American Dream. Nebraska puts forward a complex, mature argument that it doesn't matter whether American Dream is will ever come true, but that people can't function without hope. If they're being beaten with a stick the carrot dangling in front of them becomes that much more crucial. We see it in the explicitly pointless quest that forms the backbone of the film, in the way the townspeople and Woody's extended family are utterly entranced by even the idea of financial security and wealth. That Woody, a miserable, decrepit, coffin-dodging old man, becomes the embodiment of the American Dream is a clever commentary on the current uneasy psyche of modern America;. This is a country beginning to feel its cultural, financial and industrial grip on the world slipping; going through the geopolitical equivalent of a mid-life crisis. Nebraska isn't a satire, it's important that Payne never pokes fun at Woody, treating his simple desires with admirable sincerity. In the perfectly pitched finale we see that a miniscule, symbolic triumph can be as powerful as anything tangible - the characters consciously embodying a lie in order to provide some comfort to those spiralling the economic plughole. This is touching, beautiful and humanistic stuff from start to finish; occupying very similar psychic territory to David Lynch's The Straight Story, and titans of Americana like Five Easy Pieces or The Grapes of Wrath. Crucially, it recognises the importance of the capitalist dream that fuels America, fantasy of cars, God, money, consumer goods etc. In the end they're all lies, but when everything else recedes lies are the only crutches these people have got and you'd be a cruel git to kick them away.